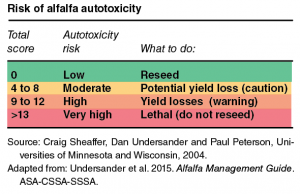 Autotoxicity is the first factor to be checked in fields before planning to re-seed alfalfa. In other words, a field with good soil moisture; fertility; absent of pests and diseases; and free of water ponding may still not be ready for re-seeding alfalfa if residues from old stands are still present in or on the soil. The goal of this fact sheet is to explain alfalfa autotoxicity and present an objective way to assess this issue in contrasting soil-weather scenarios. Alfalfa autotoxicity is caused by substances produced by alfalfa plants that moves into the soil, inhibiting new alfalfa seedling root development. This leads to reduced vigor and seedling death. Those substances are secondary metabolites, medicarpins and phenolic compounds. Mature alfalfa plants accumulate them with the objective of defending themselves against pests and diseases attacks. Eventually, those metabolites escape to the soil, inhibiting new seedlings, consequently, allowing the existing plants to grown unimpeded. Unfortunately, those compounds can remain active in the soil for prolonged periods. Even though the old alfalfa stand is terminated, the compounds will continue to be active in the soil for months or years after termination. The breakdown of the metabolites will vary according to soil, weather and field practices. Therefore, timing to re-seed alfalfa vary by specific field. The age of the alfalfa stand plays a major role in the levels of autotoxins released into the soil. One- to two-year-old stands have less potential of producing autotoxins than three- to five-year-old stands. Furthermore, certain parts of the alfalfa plant will produce different amounts of autotoxins. Leaves and flowers will produce more autotoxins than stems, roots and seeds. Chung and Miller (1995) found that water extracts of alfalfa leaves and flowers drastically reduced seedling germination by 26 and 38 percent, respecively; while water extracts of alfalfa stems (16 percent), seeds (12 percent) and roots (8 percent) had a lessened effect on alfalfa seed germination. This dataset showed flower parts have the highest concentrations; consequently, alfalfa stands will have higher levels of auto­toxins after flowering (reproductive stage). Hedge and Miller (1992) proved that reproductive-stage alfalfa plants extracts at concentrations as low as 20 grams per milliliter were enough to reduce seed germination. On the other hand, vegetative stage alfalfa plants started to decrease seed germination at a concentration of 60 grams per milliliter, which is three times higher. The thickness of the alfalfa stand is another important aspect. The higher the density of alfalfa plants in a field, the higher the amount of autotoxin produced. 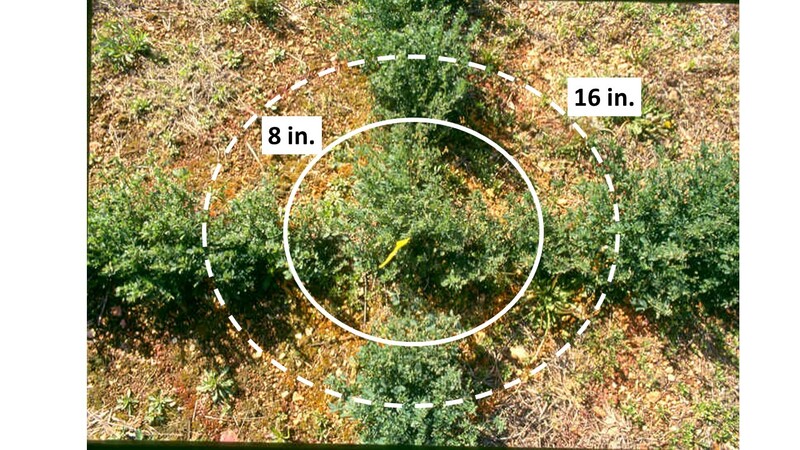 According to Jennings (1999), the zone of influence of an old alfalfa plant on alfalfa seedlings extends to a radius of 16 inches. Alfalfa seedlings within 8 inches proximity to an old alfalfa plant will not survive. Seedlings within 8 to 16 inches will have reduced growth and those more than 16 inches away will not be affected. 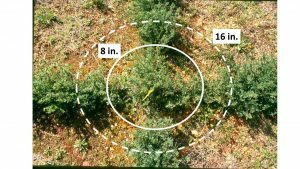 Based on these findings, it is conclusive that a stand with a plant population of 0.8 plants per square foot will have issues with autotoxins. On the other hand, an alfalfa field that contains large dead areas due to seedling failure and water ponding where plants less than one year old were present, can be re-seed with no autotoxin issues. As previously mentioned, the autotoxins are water soluble and will move thru water in the soil. Jennings and Nelson (1998) observed that autotoxic chemicals passed more rapidly through leaching columns of sandy soil than silty clay loam. It happened because the autotoxins bound with the soil colloids found in fine-textured soils, such as silty clay loam, making those compounds less mobile. This reduced autotoxin mobility is a double-edge sword. For instance, in course-textured soil (e.g., sandy soils), the lack of colloids make the autotoxins free to react easily with the new seedlings; however, the autotoxins also are free to easily leach away from the soil surface. Conversely, in fine-textured soils, such as silty clay loams, the presence of colloids will reduce the amount of autotoxins reacting with the seedlings; however, its effects will last longer due to less autotoxins leaching to deeper soil layers. Therefore, in sandy soils, expect a lethal alfalfa autotoxicity when re-seeding months after terminating an old stand. However, the autotoxins will leach away from the soil surface in a matter of a year if appropriate rainfall or irrigation is applied. 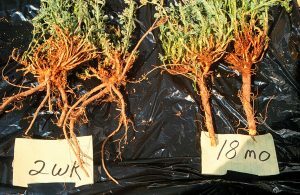 In heavier soils, expect a less severe alfalfa autotoxicity in the short-term; however, the autotoxins will last two or more years, depending on the amount of rainfall or irrigation. The autotoxins are degraded by soil microbes; therefore, soils containing high organic matter and with high temperatures will have a bigger and more active microbiota that will degrade the autotoxins more rapidly. Figure 1. The alfalfa strip on the left was reseeded two weeks after tilled old stand. The alfalfa strip on the right was reseeded 18 months after tilling the old stand. Alfalfa autotoxicity on the right led to poor establishment. Photo courtesy: Dr. John Jennings, University of Arkansas. Figure 2. Plants dug from left and right alfalfa strips illustrated in Figure 1, respectively. Alfalfa autotoxicity in soils led to alfalfa taproot death (left) resulting in branched shallow roots. Absence of autotoxicity led to growth of a deep taproot (right). Photo courtesy: Dr. John Jennings, University of Arkansas. Figure 3. 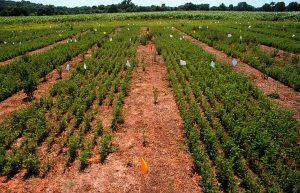 Autotoxins produced by old alfalfa plants (center flagged plant) will drastically effect new plants within an 8-inch proximity, and have negative effects in new plants within a 16-inch proximity. Photo courtesy: Dr. John Jennings, University of Arkansas. 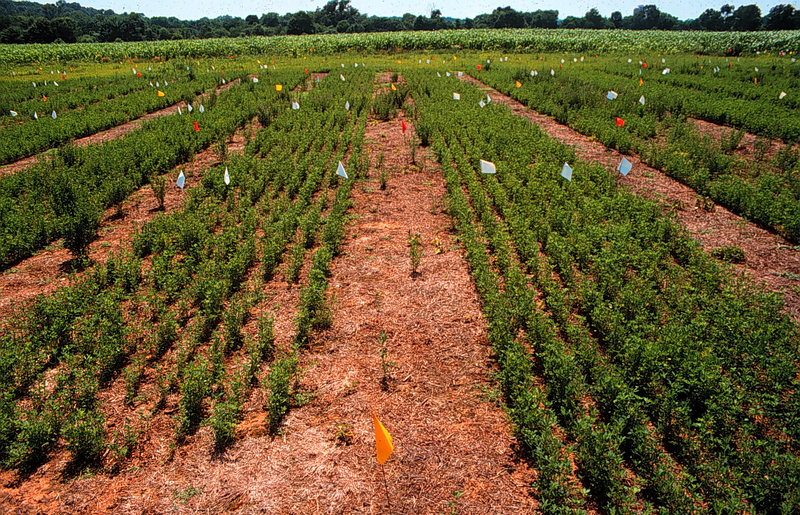 Alfalfa termination timing also has an effect on the levels of autotoxins left in the field. Alfalfa plants will have a higher concentration of autotoxins after flowering. Therefore, terminating alfalfa before flowering will potentially decrease the amount of autotoxicity. Removing all aboveground alfalfa forage at termination (stems, leaves and forages) may decrease autotoxins because the plant parts that contain the highest concentration of autotoxins are removed. Tilling the soil to incorporate all alfalfa residue into the soil to allow fast decomposition by soil microorganisms, or desiccating old alfalfa stands with herbicides as a termination method are both practices that can decrease the amount of autotoxins; however, the efficacy has not been tested in Oklahoma. Chung IM, Miller DA .1995b. Effect of alfalfa plant and soil extracts on germination and growth of alfalfa. Agron. J. 87: 762-767. Hegde, R.S. and D.A. Miller. 1992. Scanning electron microscopy for studying root morphology and Anatomy in alfalfa autotoxicity. Agron. J. 84:618I620. Jennings JA, Nelson CJ. 1998. Influence of soil texture on alfalfa autotoxicity. Agron. J. 90: 54-58. It is difficult to anticipate how re-seeding alfalfa after an old alfalfa stand will succeed. 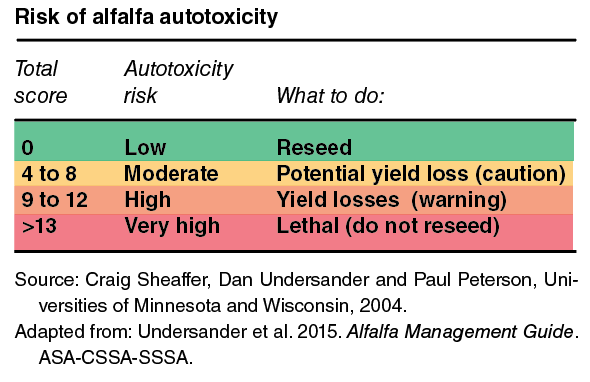 However, the Table 1 helps assess the autotoxicity risk of reseeding an alfalfa field.